1. Put the spinach in a large sieve or colander set over the sink. Slowly pour just-boiled water from the kettle over the spinach to wilt. Refresh under cold water, and then squeeze out the excess water. Very roughly chop and set aside. 2. Toast the sesame seeds in a dry frying pan set over a low-medium heat, until golden and fragrant. Lightly crush in a pestle and mortar, and then stir in the sugar, mirin and soy sauce, until dissolved. 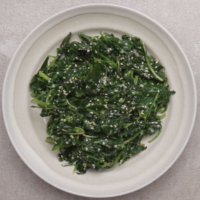 Toss through the spinach in a serving bowl and dot the sesame oil over the top.